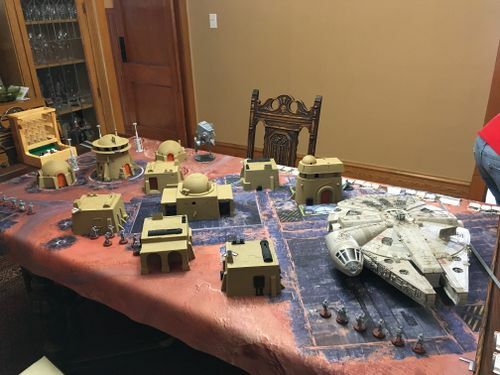 Hello all, had my first game of Star Wars Legion, for the most part I was impressed with the rules, anyone else try it? I have a few pics but terrain is partially painted and pieces were fresh off the hobby table. I have not tried it yet, but I would like to. I haven't tried it yet. I've heard good things about the core rules, but the scale change from Imperial Assault and my experience with Runewars kind of soured me on it. Still, I'd be up for giving it a go sometime. I'd be interested to hear more about your game and what you like about the rules. Karl, I thought you liked runewars? I did but when Greenfire closed, with it went the only group of Runewars players in the city. I should probably not hold that against Legion, which will probably have tons of players. I am cheered though by still having a big good-guy army I like that I can use for other games. And of course Tim and I can still play if we want. It's hard to deny that the core rules of FFG games tend to be tight and fun to play. Runewars is fun. One thing I am anticipating/fearing for Legion is the X-Wing-ish CCG aspect of play where remaining competitive in the game comes down to having stacked the right combination of upgrade cards on your units and acquiring upgrade cards drives unit purchases as much as the units themsleves. The Greenfire Runewars community didn't seem to suffer as much from this because Runewars was a sidebar and they got their comp-play fix on X-Wing or Armada. However, a competitive Runewars scene (if such a thing existed) would probably be just as distastefull to me. The FFG business and competitive model is exactly why I won't touch this. "Buy buy buy, multiple copies, to have it all and be competitive!" Then you get spammy lists like 3 Millennium Falcons flying around at once...and the narrative is sucked away. Quite unfortunate. That said, the vehicle models are really cool from what I've seen! The infantry is average.